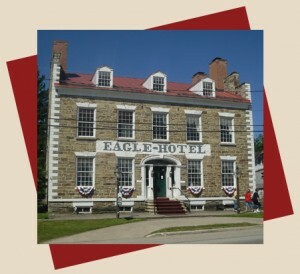 Because of it’s unique geographical location and natural harbor, Erie County, PA has a rich and varied heritage, from it’s early usage by Native Americans to the quest for Colonial empire to the development of the Industrial Age. “Erie” takes it’s name from the Eries tribe of Native Americans who inhabited the area. The Eries subsisted on local game, fish from the numerous creeks flowing into Lake Erie and the limited growing of corn. During the 1700s, the waterways and portages were central to the conflicts among the French, British and Americans for access, claim and control of the eastern portion of North America. A chain of forts was built along this route to protect these interests. When early settlement began in the late 1700s, land claims were in dispute. The federal government purchased the “Triangle” in 1788 from Chief Cornplanter of the Six Nations and sent Andrew Ellicot to survey the area. In 1792 the state purchased the area from the federal government giving Pennsylvania access to the Great Lakes. The Pennsylvania Population Company was formed and set up articles enabling settlers to obtain valid deeds for their land. Early industries such as ship building, shipping, saw and grist mills, lumbering and agriculture and later the fishing industry, took advantage of the water resources, the forests and the moderate climate. The construction of roads, the Erie Extension Canal and railroads enabled the further development of the port, manufacturing and forges. The jobs these occupations made available attracted a diverse mixture of ethnic groups (Irish, German, Italian, Russian, …). This offers a brief account of what was happening in Erie County through the late 19th century. The last one hundred years has a story that is just as fascinating – development of one of the country’s largest grape-growing regions, the building of the Warner Theater, the Pontiacs baseball team, growth of the plastics industry and more. As a result, Erie County, PA is proud to claim numerous heritage sites and more than twenty historical societies and museums whose missions are to preserve and interpret the history of their surrounding communities. Check them out in the Erie Yesterday brochure!